This month, we had a great opportunity to express creativity to the field of architecture. 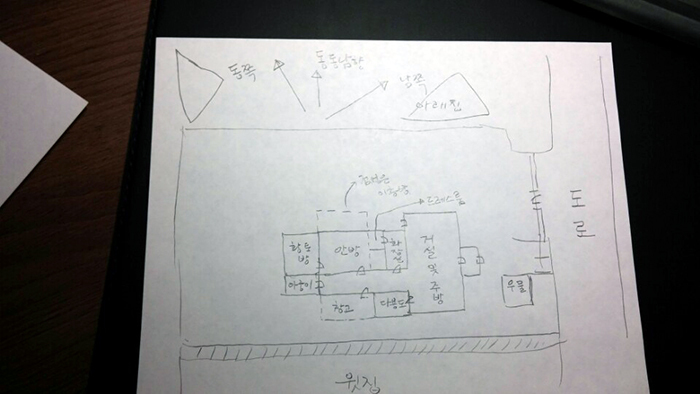 The request was to design a house for a husband and a wife in Korea, planned to be built in the beginning of next year. 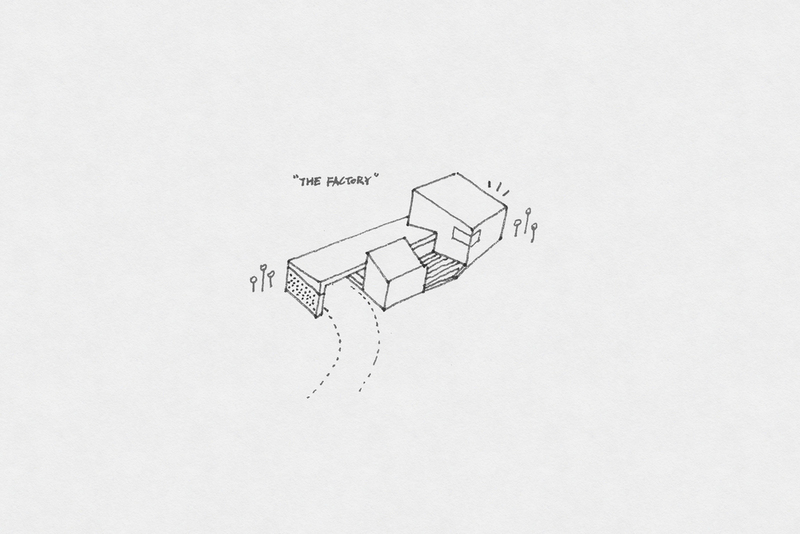 The information we received in our hands was this rough sketch of floor plan, approximate size considering the budget and location/climate of the site. Some additional requests were, solar panels for guest room, parking lot connected to the entrance with a shade and a Hwangto Clay room. Hwangto Clay room is a traditional Korean way of sauna designed to produce gentle infrared heat that increase blood circulation and stimulate detoxification through skin. From this we challenged how we can design a house remotely, followed by some of the initial concepts which are to be further developed. 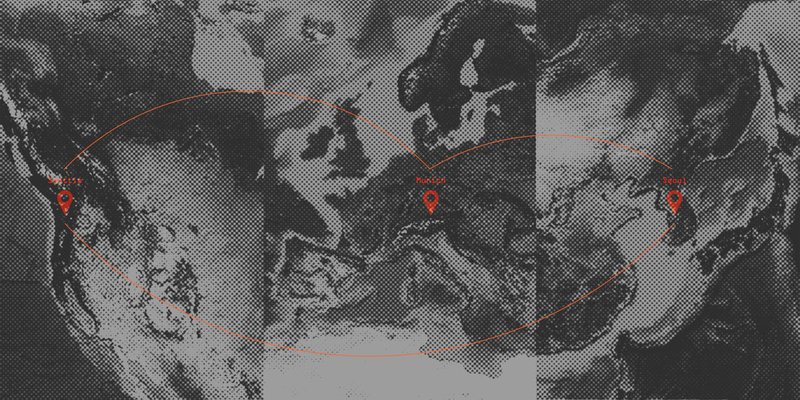 Physically, the client was located in Seoul, and the designers in Munich/Seattle. Therefore it turned out to be a small project, yet quite global. Since it is essential to fulfil their needs and to get the feedback during the progress, the communication was done via Skype from time to time, obviously. As you must now realise, we have never visited the site due to time and distance reasons. But thanks to Google Earth, the surroundings around the site and the topography could be easily understood by navigating. On top of that, since it is also very important to have the direction of the sunlight in mind, we tried to simulate the sun movement by time. Generally, it is better to place the main windows to face south, considering the climate conditions of Korea. Korea relatively has four distinct seasons which means that the house demands more warm sunlight in winter and more cool air flow in summer to maintain pleasant temperature for living. Additionally, Koreans prefer more to stay under shades than to absorb direct sunlight, compared to western countries. First concept was inspired from the silhouette of a factory. Conventionally, factory buildings are consisted of slanted roofs and modular units of halls for efficiency and expandability. 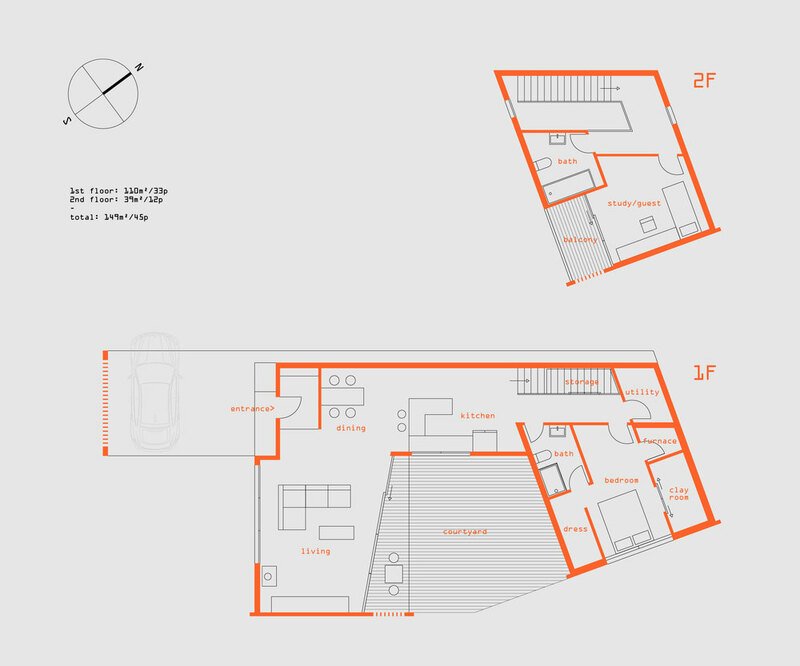 The intension was to retranslate these principles and apply them into living residence. The simple slanted blocks are composed in a dynamic way to create more three dimensional effect for spacious feeling. The brick cladding shades inherit the principle of efficiency by using standard units to create unique details. Moreover, the name of the concept 'Factory' (공장/工場) can be renamed as a homonym in Korean, 공장/共場, which means 'Communal Place' (공동의 장). So it is meant to be a place for living, together. The site is located within a small residence area in the middle of a valley. The house is surrounded by a gravel walk for cars and also for walking. On the other side of the entrance lies a garden for small farming. The entrance is connected with a shaded parking lot for easy access. The courtyard is the central place not only for gathering, but also for open visibility. The kitchen stays on the way to different blocks, so that it is a place where people frequently meet on the way. The clay room - one of the specific requests from the client - is located next to the bedroom with a sliding door so that they can share the warm heat together. 2nd floor is used as a study/music room and also a bedroom for guests. Brick cladding shades welcomes at the entrance with subtle sunlight shining through. They also add value to the courtyard shade and the balcony upstairs. Solar panels are located on the 2nd floor roof to provide electricity to the guest room. Three blocks are semantically divided regarding functionality. Horizontal concrete block works as a 'common path', left block and the deck as 'common space' and the right block as 'private space'. In the end, people 'move', 'gather' and 'live' in a house. The courtyard is the hero of the house since it represents 'communal place' concept intention. It becomes a cafe terrace with sunshine in the morning, a barbecue fireplace in the afternoon and an open cinema at night. This concept was inspired by light. The silhouette of the house is visually leaning towards the sun since the light shines on the site diagonally. 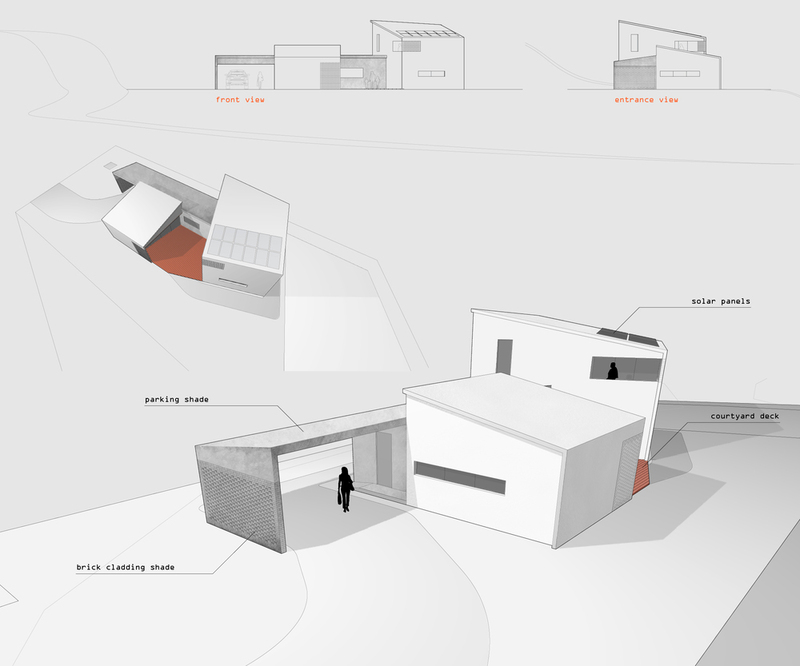 The plan of the house is basically intended to absorb the sun light in a better way. Living room, bedroom and kitchen location is considering where the light comes through. The arrangement of the kitchen surrounds the person for efficient use of space. In the daytime, natural light pass deep inside through big windows. At night, ambient lightings are designed in different places to maintain the brightness. The lightings at the big entrance and over the balconies of 1st and 2nd floor gives warm welcomes to the resident and visitors. The ambient back light below the courtyard deck creates floating illusion. The house is semantically divided by 3 different roles. Socializing, resting and revitalising. The distance between entrance and kitchen is minimized considering grocery delivery frequency. Front facing big windows helps the residents to rest and enjoy the scenery wherever they are. This warm hearted house always welcomes people with the big arch shade entrance and vertically extruded door. The glass covered light pillar brings the light in from outside. Different from indirect lights through the windows, light pillar delivers 'light more tangible'. The next steps will be later on updated depending on the progress. It sure will be a long way to go. Published on 31st of March, 2015.